Banners are the most used outdoor signs. They come in different sizes; can be large, medium or small depending on your requirements. They are easy to roll up, this makes it easy to transport from one place to another, and storage becomes very easy. They can withstand mild or worse weather conditions. They can be used with other accessories for ease displaying and moving them. Banners are cost-effective, and they have a wide range of price depending on the size you need. Aluminum signs offer excellent use for outdoor signs. Mostly, aluminum signs are used in parking lots but can also be used to put a sign of ‘no trespassing` or other signs. They can be drilled onto a pole or a wall. Their sizes vary from small to medium. However, it is the heavy-duty aluminum signs that can endure harsh weather conditions. Aluminum signs are easily movable and the price range from $15 -$450. Flags come in different types. Flags are preferred in windy locations as they move with the wind. When comparing banners with flags, flags are less durable and fragile. They need careful handling as they can easily tear or fade because of the sun. Flags can be small or large in size. They withstand mild conditions. The price range from $15 to above $450 depending with type, size and accessories needed. Yard signs are a good way of advertising needed especially targeting large crowds like in political campaigns. They are light, can be customized to include wire stakes, grommets, and can be cut into a shape of a design you desire. They are inexpensive, easily movable and can withstand mild weather conditions. They are similar to yard signs, but they are stronger and durable. Preferably, use them for a property, directional, safety and surveillance signs. Sizes are small, and medium can be cut into different shapes and are easily movable. They are large signage with high visibility and give shade from the sun; preferably, for outdoor events, such as . sporting events. They are easy to store and move around. Regardless of the outdoor sign, you choose our designs can be customized and are printed to give the best image as per your need. 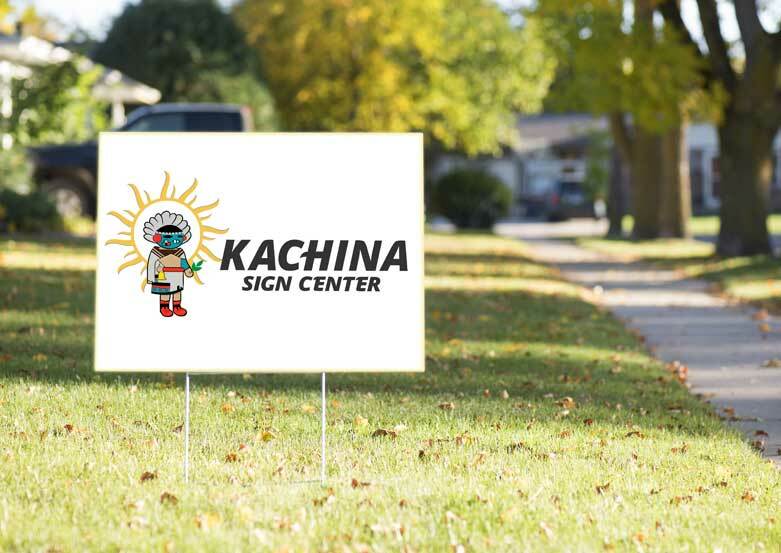 For more details and clarifications, contact Kachina Sign Center today.